Actress Joey Darling is beginning a new season . . . of her TV show and her life. Joey Darling’s life is finally on track. Her hit series has been picked up by a new network, her relationship with Detective Jackson Sullivan couldn’t be better, and she’s even bought a house. But right after taking possession, Joey discovers a dead body upstairs. Joey knows she won’t have any peace until she figures out why a dead woman was left at her house and who killed her. And she desperately needs peace as the “normal” life she’s trying to establish quickly progresses from great to the brink of collapse. The countdown is ticking as Joey must soon leave to begin filming. But one gaffe after another slows her investigation and makes her question her choices. The closer Joey gets to answers, the more someone is determined to make sure this season of her life is canceled—permanently. 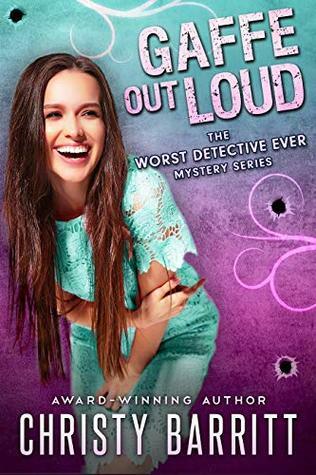 My thoughts: GAFFE OUT LOUD is the seventh book in Ms Barritt's cozy mystery series The Worst Detective Ever but it does stand alone. Fans will want to read the other books in the series though. In order, they are: Ready to Fumble, Reign of Error, Safety in Blunders, Join the Flub, Blooper Freak, Flaw Abiding Citizen, and GAFFE OUT LOUD. It has been awhile since I read a book in this series and I'd forgotten how funny Joey is. Jackson makes a nice side-kick, though he is much more serious than Joey. Travel along with Joey as she tries to figure out who killed the woman in her new house -- and why. Jackson does allow her to work with him some, but mostly she's on her own. I did figure out who-dun-it but not why or anything like that. The story is fast-paced and I read the entire thing in an afternoon. If you like cozy mysteries, grab a copy of GAFFE OUT LOUD or any of the other books in the series.